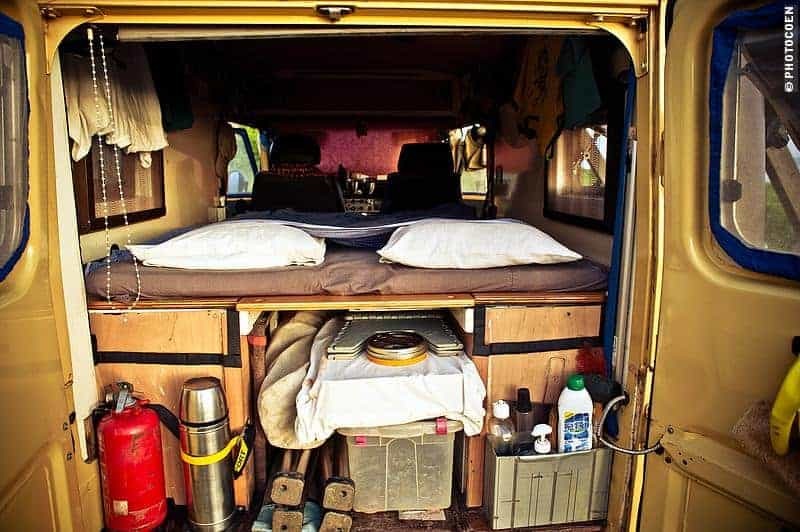 When we prepared for our overland journey to Southeast Asia in 2003, low budget was key. So, instead of buying curtains or blinds, we took the roller shades from the house I was selling and used them for the Land Cruiser. It was the first set of car shades we had, but over the years others followed for different purposes. Before giving the list of WHAT we have, let’s talk about WHY we have them. 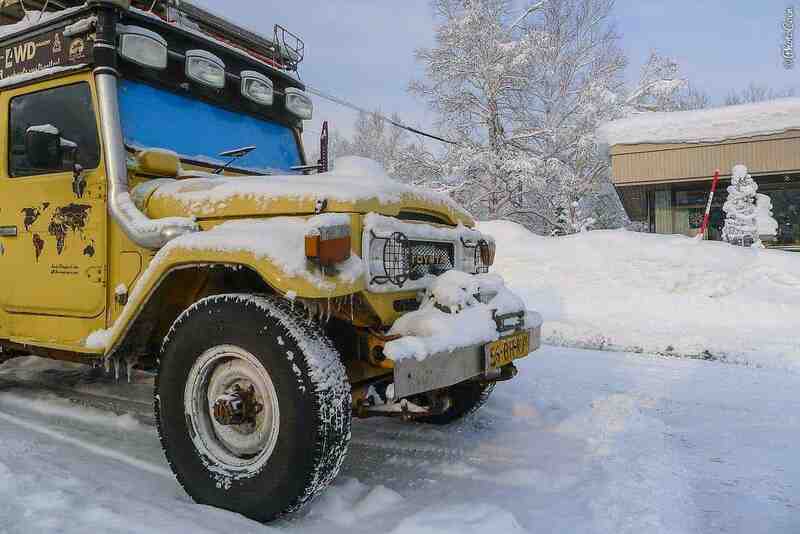 We always have the shades down when we park the Land Cruiser e.g. to go shopping or sightseeing. In 15 years we’ve never had a break in so, while we have no statistics to show it works, we figure the shades do help. 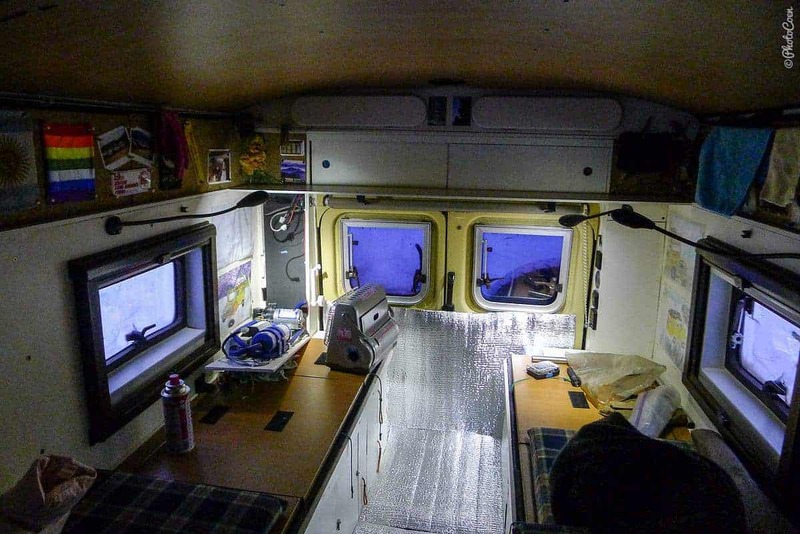 At night we use the roll-up blinds for privacy purposes, as well as to not to be spotted from afar when wild camping. In winter we have car shades for insulation. Over the years we have tried different shades for different purposes. Here are among the ones we find the most useful. A roll-up blind in front (and rear) are the quickest to close and open. Another option is to use reflective shades. We don’t because the front window of the Land Cruiser is relatively narrow and is placed fairly straight up. As such it doesn’t absorb as much heat as the average car window of modern cars. For the windows on the sides we bought material and made custom-sized window shades, using velcro to keep it in place. Magnets or magnetic strips would be good options too. Custom-made shades on the sides held in place with velcro (magnets would work too). Our front rolling shade isn’t a blackout screen. However, we do carry a dedicated blackout curtain, which we put up only when rough camping in a place where we prefer not to be spotted from afar. It’s kept in place with velcro. Of course, it would make much more sense to combine the two into one and have blackout roller shade (it’s on the list for, oh you know, one day). 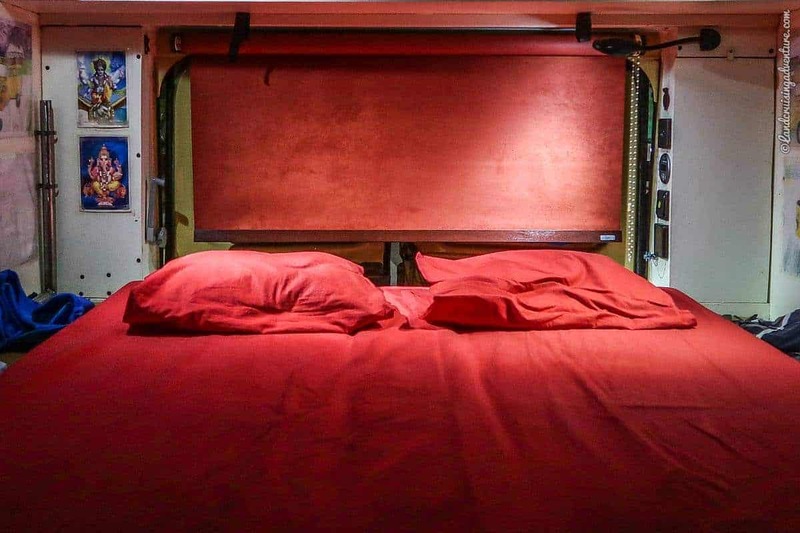 Our rear blackout rolling shade doesn’t keep out all the light as it doesn’t cover the whole area. But because we have tinted the rear windows, very little light is escaping and you barely see it from a distance. Blackout rolling shade in the rear. On the rear sides we have a blackout shade. It’s an integrated system that doubles as mosquito netting. Super handy and we bought it in an outdoor store in the Netherlands (I can’t find it on Amazon). In winter, the windows are the weak point to keep out the cold. 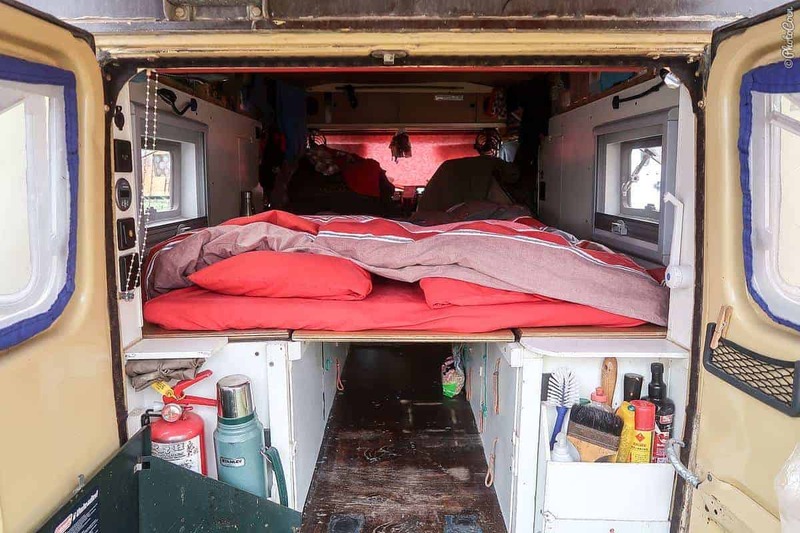 During our freezing winter in Japan we learned that reflective foam insulation material in front of the windows makes a huge difference in staying warm. We bought a roll and cut pieces to fit exactly in the front windows, side windows and also stuck it against the entire rear doors. We also put a piece on the floor. 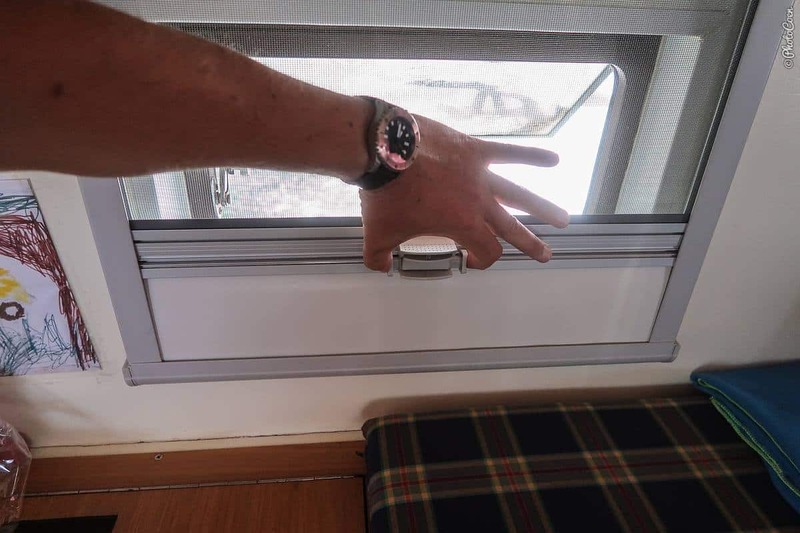 Contrary to what you see on the photo: the material should be put the other way around, so the aluminum side to the window. For the piece on the floor, the aluminum should be underneath. One side blue, the other side aluminum. The winter insulation also worked well on the floor. From winter, let’s jump to summer. 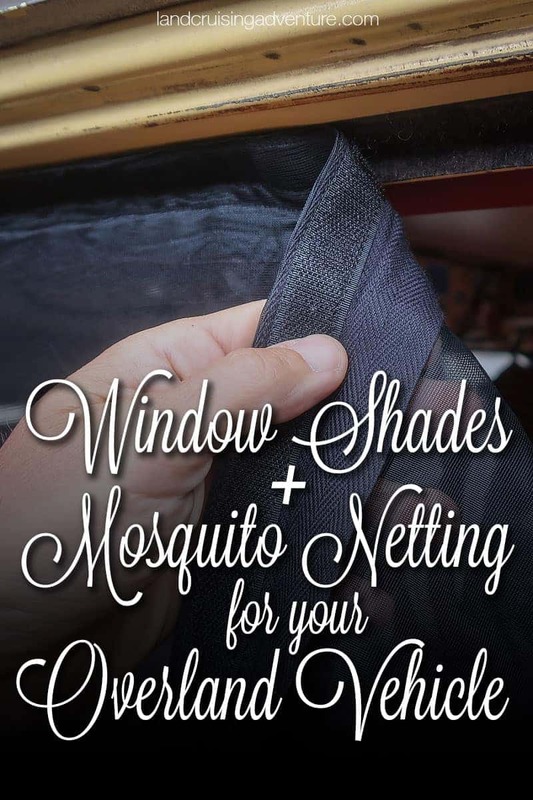 Technically not shades but it fits the topic so we figured to mentioned as well: mosquito netting. 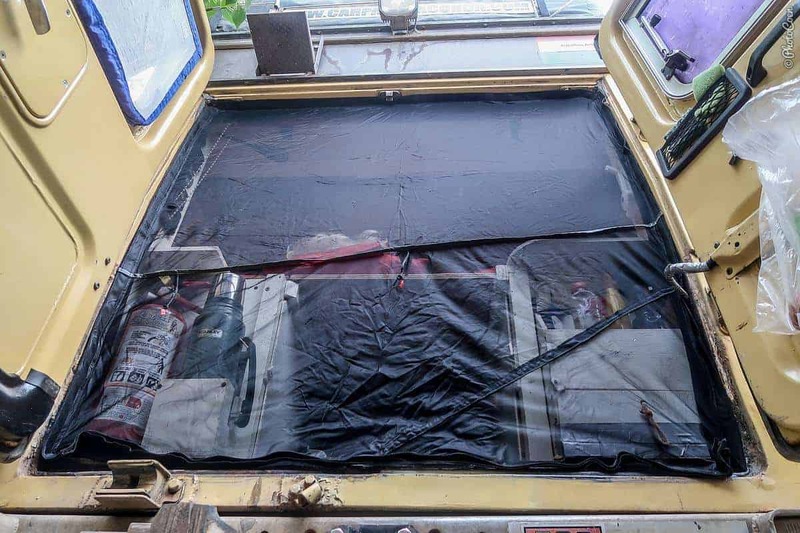 For the small rear windows I made mosquito netting that is kept in place with elastic bands. Making use of the velcro already in place, I made mosquito netting that keeps it in place the same way. 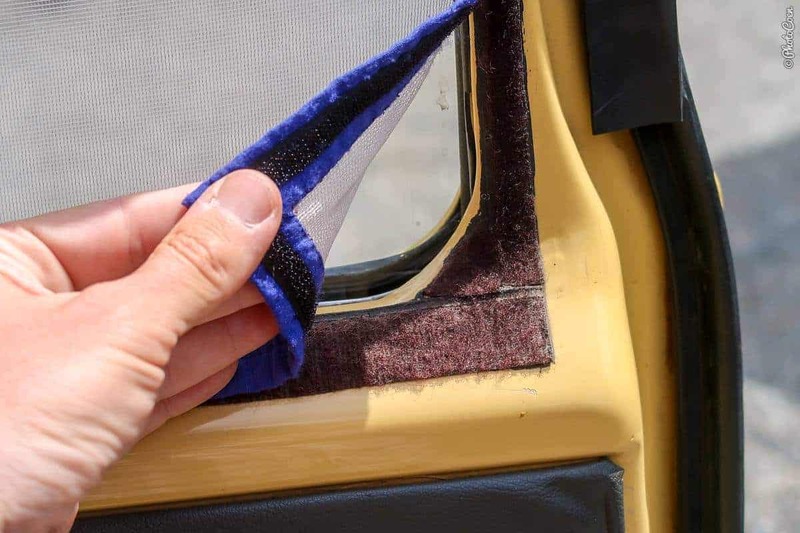 While magnets are perfect to keep the regular shades in place (see #2), velcro is a necessity to make sure all mosquitoes are kept out. This one was easier to make, simply sewing elastic bands all around. 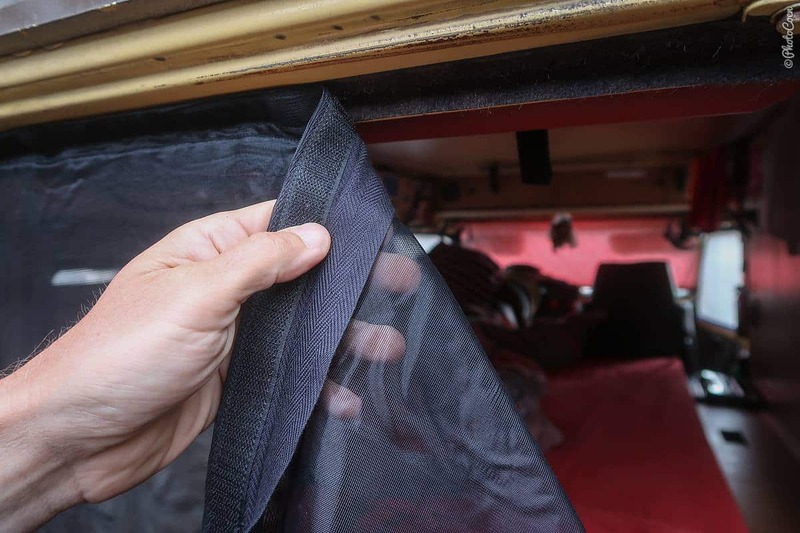 If it’s too hot and we are camped in a safe place, we can sleep with the doors open, putting a custom-made mosquito screen in place with velcro. The rear doors don’t close properly so lots of dust comes flying in on unpaved roads. To minimize the dust, I have made a dust screen that I then put in place, using the same velcro set up. 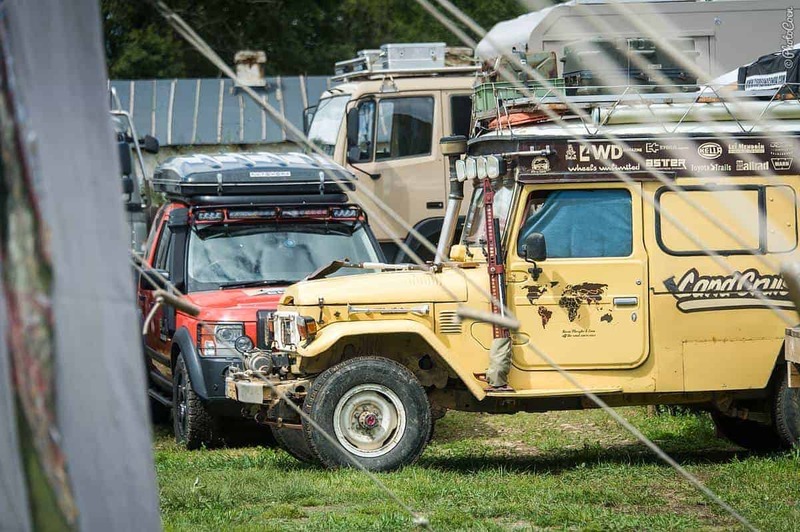 Velcro is your best friend in an overland vehicle – make sure to add it to your vehicles first-aid kit! Velcro for mosquito netting in the back. 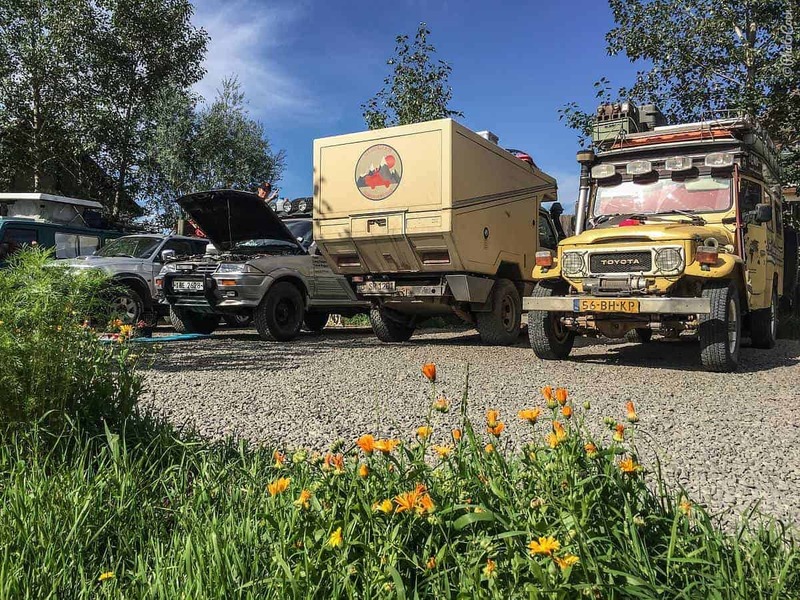 We hope this overview helps you in the preparation of your ultimate overland rig. 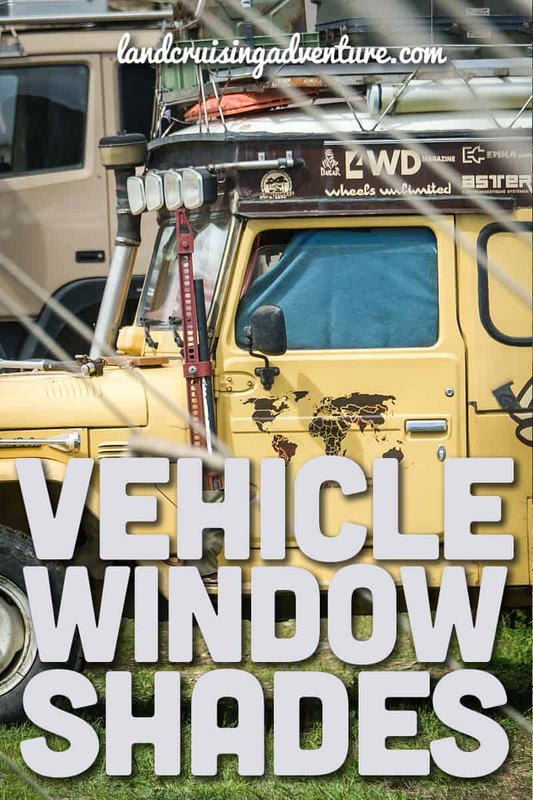 What kind of car window shades do you use on your overland vehicle? Please share in the comment section below. As little as $1 helps. Thanks and enjoy the ride. Yes, I’ll be a patron!